Hannah Genders visits a historic house and garden. When Kevin and Elizabeth Rolph decided they would like to leave their jobs in Cambridge and have a lifestyle change by running a bed and breakfast, they had two major requirements at the top of their list. Somewhere that had hills (after 27 years of living in the flat landscape around Cambridge) and a garden to develop. Initially they were looking in Derbyshire as they didn’t know Worcestershire at all, but a chance encounter made them visit the Malvern Hills and then begin to look in that area. 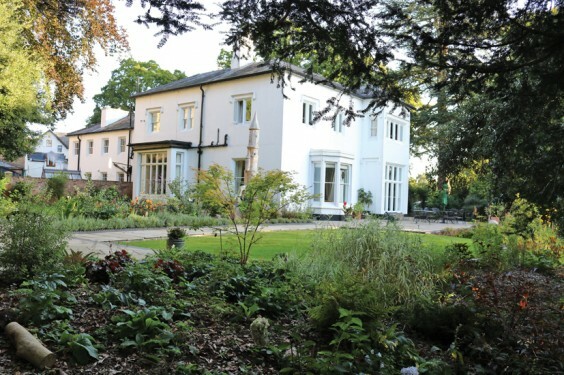 They came across a wonderful old property called The Dell House in Malvern Wells. The Dell House sits just under the Malvern Hills above the Three Counties Showground, so this has fulfilled the hills and walking requirements, and the garden – although overgrown and neglected – had enormous potential. It is about two acres in total and has a wonderful history. The house was built around 1820, and the church next door which looks down upon it was built shortly after, in 1826, by the Reverend Peter Boissier. The house is a beautiful, classic Regency design but it needed lots of work. Kevin and Elizabeth have had it re-roofed, and new windows put in. What is fascinating, in reading up on the history of the house and garden, is how often the word “sanctuary” comes up. This is a garden that for decades has been used by people as a retreat space, healing space or sanctuary. It seems to have started in the early 1900s when the house had changed hands and was opened as a “nature cure” home. During this time the Dell House had been renamed The Dell Hydro (I’m guessing they made use of the famous Malvern Spa water). It was owned during this period by a Mrs Gladys Evans, who was a member of the Naturopath Association. In its simplest terms, this is the belief that a person can be healed through rest, diet and hydrotherapy. We then jump forward to 1950 and it was again renamed, this time as Lucidor House, and described as a “House of Healing”. It’s difficult to find out what kind of healings went on there during this period, but the gardens and woods are mentioned as a vital part of the healing process. I found all this interesting when reading about the house, but I’ve jumped a bit too far ahead for the garden. After Reverend Boissier retired, a second reverend came to Dell House and took up the post at St Peter’s Church next door. According to the 1841 census, this was Reverend Francis Hopkinson and he was living there with his wife Ellen, five servants, a cook, a lady’s maid, a housemaid and a footman. It was during the ten years of Hopkinson’s time that the garden saw extensive renovations. Hopkinson had numerous influential friends in the horticultural world – Charles Darwin lived nearby for a short time, as well as Joseph Hesker, who was the director of Kew Gardens and sponsored various plant hunting expeditions. It is probably as a result of these connections that Dell House boasts some special trees; notably a Wellingtonia Redwood, two strawberry trees (Arbutus) and a large Acer, along with a tulip tree that has since died but been replanted elsewhere. It is the Wellingtonia that really stands out as you enter the driveway of Dell House. As well as the plantings, Hopkinson built a wonderful summerhouse and hand painted it on the inside with a display of the names and coats of arms of the 28 Worcestershire landholders mentioned in the Doomsday Book, the 25 signatories of the Magna Carta, and of many of the local landed families from more recent times, making a total of nearly 100 references. All meticulously painted, it is a piece of artistic history. The ceiling is also hand-painted with a map of the surrounding area. With the summerhouse as a starting point near the front drive, the pathway leads off to the rest of the garden. It winds behind the Wellingtonia specimen and you see where Kevin and Elizabeth have cut back large amounts of laurel to regrow and form a denser hedge to obscure the neighbouring houses. Continuing on this path you plunge more deeply into the trees; the tulip tree I mentioned earlier that has not survived has been artistically carved by Steve Elsby, so a green man carving pops out at you from the trunk and on the reverse a little owl peers out. As the path winds on through on old wall (all discovered by Kevin and Elizabeth as it was totally hidden by brambles) you come into the lower garden, where there is a Wendy house, stone-built in the 1900s and complete with its own fireplace! Something I thought my granddaughters would love. From here you need to look up to the tall stump of a sweet chestnut tree and another striking dragon carving looks down at you. Along another discovered path and there is more playful carving in the form of a chair and chaise longue complete with bookcase and firepit. From this point the path winds back up the terrace at the back of the house, and here Kevin and Elizabeth had some professional help with the design and layout from a local landscape architect. The main dining room spills out onto this terrace with wonderful views out to the Worcestershire countryside. The planting here they have completed themselves, and as this garden is only a few years old in its renovation it was all looking really mature. This garden is special, it is playful, but also definitely has a sanctuary feel surrounded by all the trees and places to sit and take it in, and there are a number of ways in which you can enjoy it. I want to finish with a quote from Kevin and Elizabeth that I think say it all about the spirit of this place. “We stand before you all today and make a declaration of our commitment to be guardians and stewards of the Dell House and its grounds.